Return to the world of The Warded Man and The Desert Spear in an illustrated new novella by Peter V. Brett.<br /><br />Humanity has been brought to the brink of extinction. Each night, the world is overrun by demons bloodthirsty creatures of nightmare that have been hunting the surface for over 300 years. A scant few hamlets and half-starved city-states are all that remain of a once proud civilization, and it is only by hiding behind wards, ancient symbols with the power to repel the demons, that they survive. A handful of Messengers brave the night to keep the lines of communication open between the increasingly isolated populace.<br /><br />Arlen Bales is seventeen, an apprentice Messenger in brand new armor, about to go out for the first time alongside a trained Messenger on a simple overnight trip. Instead Arlen finds himself alone on a frozen mountainside, carrying a dangerous cargo to Count Brayan's gold mine, one of the furthest points in the duchy. 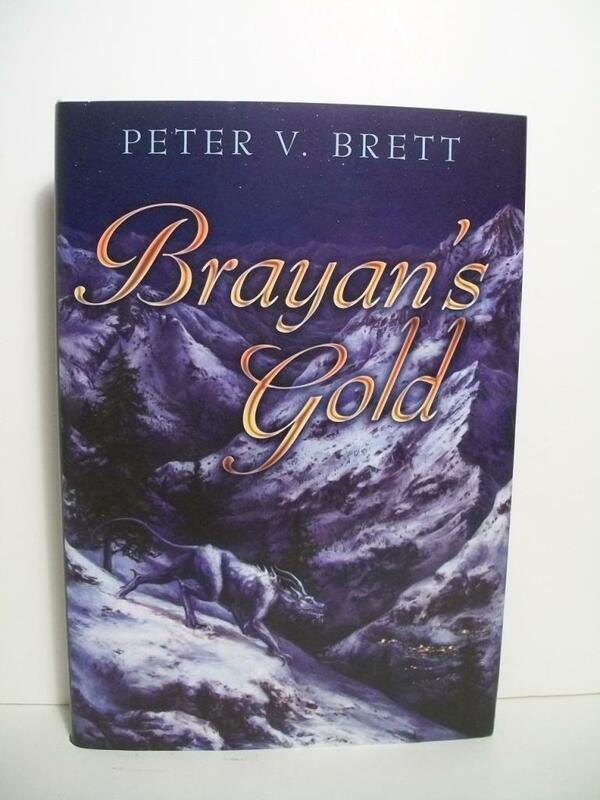 And One Arm, the giant rock demon, hunts him still.<br /><br />But Brayan's Gold may offer a way for Arlen to be free of One Arm forever, if he is willing to wager his life on the chance. Brett spins another side story (after The Great Bazaar and Other Stories) off the deliberately harsh fantasy world first developed in 2009's The Warded Man. This novella is a slight but enjoyable tale with a light, almost YA feel. Newcomers will get an easy introduction as Arlen, still an apprentice Messenger, takes on his first solo excursion into the demon-haunted night. When Sandar breaks his leg, Curk, Arlan's mentor, is assigned to take his place hauling explosives to a far-off mining town. Brigands attack and Curk flees, but the ever-brave Arlan stands his ground, making himself new enemies and allies in what will become his long fight against the demons. The lack of female characters--other than one who needs Arlen's help to dodge her father's wrath over her unexpected pregnancy--will give some readers pause, but many will find Arlen's courage inspiring. (Jan.) <br />(c) Copyright PWxyz, LLC. All rights reserved.